Age-related macular degeneration (AMD) is the third commonest cause of blindness worldwide, behind cataract and glaucoma. In first world countries, it is the number one cause of blindness. In the United States alone, there are up to 1.8 million people who suffer from AMD and more than 7 million who show early signs of AMD. A staggering 200,000 Americans develop AMD every year. Not everyone with AMD will go blind, but the risk increases with age. According to the charity organization, Prevent Blindness America, macular degeneration is without doubt the leading cause of legal blindness in Americans aged 65 and older. WHAT EXACTLY IS AGE-RELATED MACULAR DEGENERATION? AMD is a condition that affects the macula. 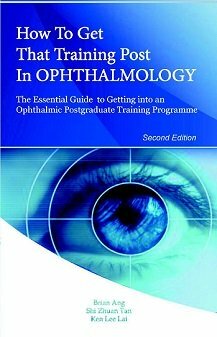 The macula is the central part of the retina which lines the back of your eye; the macula is therefore vital for central vision. With AMD, the macula becomes damaged and this causes problems with your central vision and visual acuity. In AMD, exudative and/or degenerative changes at the macula causes disruption of the cone photoreceptor function, resulting in a disturbance of the central vision. In a normal eye, light entering the eye becomes focused onto the retina. The retina is the innermost layer of the eye which converts the light into biochemical signals. These signals are then transmitted to the brain through the optic nerve. At the center of the retina is the macula, which is about the size of a pinhead. It is a specialized area of the retina that contains a few million specialized photoreceptor cells (cones). The cone photoreceptors at the macula function best in bright light, and are important for seeing fine detail, such as in reading and writing, and also for recognizing colors. In AMD, only the macula and its cone photoreceptors are damaged while the rest of the retina remains relatively unaffected. 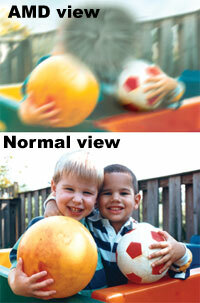 Hence, while macular degeneration affects your central vision, it does not cause total loss of sight. AMD causes problems when you are looking directly at something, such as when reading or watching television. Your central vision may become distorted or blurry and may eventually turn into a blank patch. So how does having AMD affect you on a day-to-day basis? The visual impairment caused by age-related macular degeneration may or may not be reversed, depending on the type and severity of damage. This means that blindness from AMD may be permanent. Early detection and treatment is therefore vital. - Age: AMD occurs in people over the age of 65. However, it may also occur before the age of 60 for those in the very high risk group. - Genes: AMD has been linked to certain genes that increases the likelihood of macular damage in some people. However, not all AMD is inherited. This means that even if you do not have a family member with AMD, you may still be at risk of developing AMD. - Smoking: Smoking is a major risk factor for AMD. Cigarette smoke contains many toxic substances that contribute to the damage to the macula. Studies have confirmed that stopping smoking can reduce the risk of developing AMD. - Sunlight: Exposure to high levels of sunlight (particularly ultraviolet light) may increase the risk of developing AMD. It is thought that the light causes direct damage to the macula. 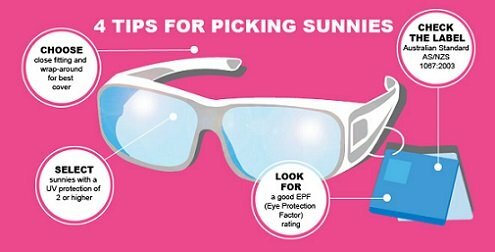 Wearing sunglasses may reduce this risk, particularly for those who are exposed to sunlight for a significant amount of time. For some of these risk factors, such as age and genes, there is nothing that you can do about them. However, the good news is that you can do something about the other risk factors. You should try to adopt prevention strategies based on these modifiable risk factors to reduce your likelihood of developing AMD. HOW CAN AGE-RELATED MACULAR DEGENERATION BE TREATED? Treatment options depend on whether the age-related macular degeneration is dry (atrophic) or wet (exudative). At the moment, no treatment is available for dry AMD. In dry (atrophic) AMD, the cone photoreceptors cells at the macula essentially degenerate and 'die'. There are no abnormal blood vessels, and hence there is no accumulation of blood or fluid at the macula. However, there may be deposits of retinal waste products called drusen. Research is ongoing, but nothing has been found to be able to effectively stop this atrophic process thus far. 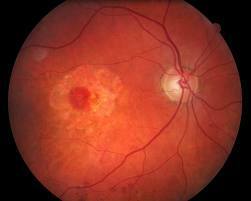 In wet (exudative) AMD, there is growth of abnormal blood vessels at the macula. These abnormal blood vessels (choroidal neovascularization) cause leakage of blood and fluid which disrupts the normal structure and function of the cone photoreceptors. The normal visual function of the macula can be regained if the blood and fluid is cleared from the macula. The aim of treatment is therefore to stop these abnormal blood vessels from growing. In dry macular degeneration, there is no abnormal new blood vessel growth. When examined clinically, there will not be any sign of fluid or blood at the macula, unlike in wet macular degeneration. This can be achieved with injections of anti-vascular endothelial growth factor (anti-VEGF) drug into the vitreous cavity in the eye. Anti-VEGF treatment is usually very effective in stopping the growth of the abnormal blood vessels. In circumstances where anti-VEGF injections may be inappropriate or insufficient, photodynamic therapy may be considered. Photodynamic therapy (PDT), is a type of laser treatment which combines a light sensitive drug and a low energy laser to the macula. The chances of success from treatment are highest when treatment is started EARLY. So please ALWAYS monitor your vision in each eye daily for any blurry patches or distortion. This can be done with the Amsler grid. If you detect any problems with your vision while testing with the Amsler grid , contact your local ophthalmologist as soon as possible for further evaluation.